Framelock Barriers™ are a product designed and manufactured by Eventquip. Eventquip is a sister company of Total Event Services, an event management company based in Darwin. Total Event Services commenced trading as Top End Sounds in 1981 and has demonstrated over 27 years of commitment and service to the Northern Territory’s event and entertainment industries. 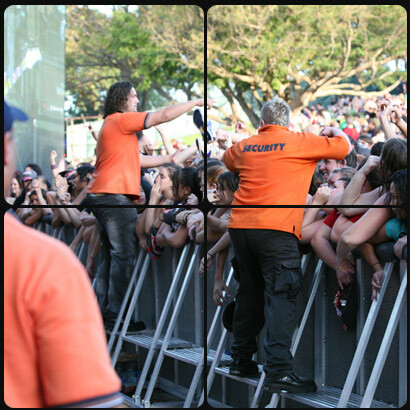 Eventquip was developed to manage a number of event products, the first being Framelock Barriers™. Framelock Barriers™ are designed and manufactured in Australia and New Zealand. Framelock is a lightweight modular system of hi-tensile aluminium crowd control barriers and temporary fencing manufactured to meet or exceed Australian and international standards. See more under Product Safety & Compliance.